This guide will show you how to change the Windows 7 “Login Screen” background wallpaper to the image of your choice. The default wallpaper for the Windows 7 sign in screen (also known as the “Lock Screen”) can get a little boring after you’ve seen it a thousand times. This brief tutorial will show you how to change it to a different picture, using a small, safe and free Windows program. Head over to the Windows 7 Logon Background Changer download page, and click the Download button towards the bottom of the page (it’s below the Change log section). Select I Agree on the License Agreement screen, then click the Next button. The rest of the installation is just as straight forward – keep clicking Next until you’re done. 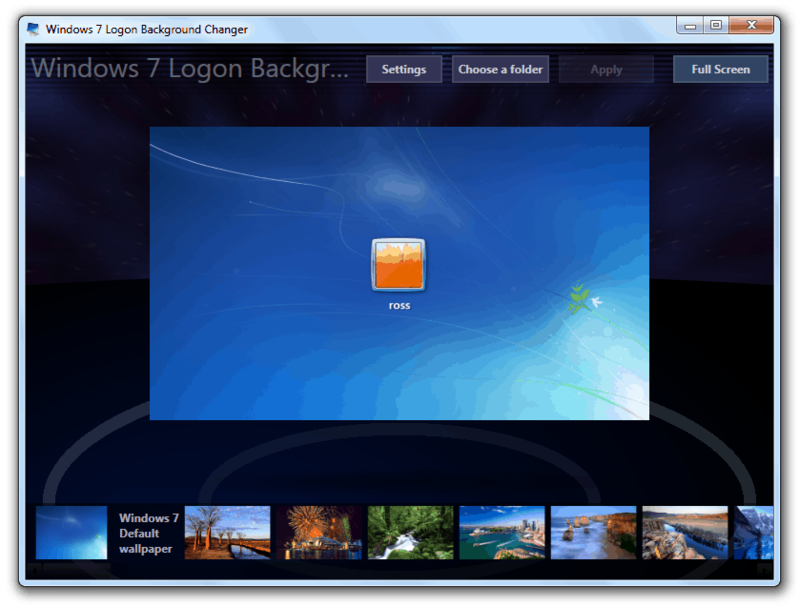 Launch Windows 7 Logon Background Changer from your Start Menu (it can be found by selecting All Programs and then scrolling through the list). Now you’ll be presented with the main interface. The bar at the bottom of the screen has a list of “included” images that you can use. The main Window will display your current Windows Login screen, and then ‘preview’ what it will look like when you select a new image. Try selecting one of the included example pictures, and you’ll see a preview of what it would look like. To set your own picture as the background, click the Choose a Folder button from the top menu. Navigate to the folder that contains the image you want to use, select it, then click the OK button. The bar at the bottom of the screen will now display all of the pictures in the folder you selected. Choose the image you want to use from the lower bar by clicking on it once. The main window will now give you a (basic) preview of what your new background will look like. Click the Apply button if you’re happy with it (or even just want to try it out – you can change the wallpaper/image at any time, as many times as you want). The screen will flash momentarily as the program applies the change. To check out your new background, click the Start Button, then the small ‘arrow’ next to the Shut down button, and finally Lock . Ta-da! Your new Windows Login/Lock screen!